Note that metalformers may find it difficult to acquire accurate shear-strength data, and to duplicate test results. Consequently, they often will use assumptions in force calculations rather than use actual test data. For example, engineers may assume that the shear strength of mild steel equals 70 to 80 percent of its ultimate tensile strength (UTS); for aluminum, they might assume shear strength to be 50 percent of UTS; and for stainless steel, 90 percent of UTS. However, shear strength can vary significantly within the same material type. For example, shear strength for copper alloys can range from 50 to 90 percent of UTS, depending on the alloy. As a result, calculating accurate cutting and punching forces can prove challenging, due to the lack of reliable and accurate shear data. To simplify matters, engineers can substitute UTS for shear strength in their cutting- and punch-force calculations, but the result will be an overestimate of actual forces. Punch-point performance is best when maximum point load remains below 60 percent of the compressive strength of the punch material. Compressive strength depends on the tool-steel grade and its hardness. When punch-point loads exceed 60 percent of the tool steel’s compressive strength, engineers should consider changing the punch material, adjusting heattreatment, or both. Punch heads break for two primary reasons: high forces from either impact or snapthrough. Impact failure results from excessive loading, which literally crushes the punch head. This type of failure usually occurs due to tight cutting clearance or an excessively hard or thick workpiece material. Snapthrough failures occur due to a sudden unloading of pressure on the punch, often caused by excessive punch-to-die clearance and when stamping higher-strength materials. Other factors that contribute to head breakage include punch pumping, caused by poor punch-body to punch-holder fitup, and the use of high-hardness backing plates. The punching force distributed through the punch body ultimately transmits to the punch head. For best performance, stampers should ensure that punch-head pressure not exceed 40,000 psi. Excess pressure can crush the punch head. When head pressure exceeds 20,000 psi, engineers should specify hardened backup plates to adequately absorb punch impact without cracking, breaking, deflecting or deforming. Tougher tool steels such as A2 or S7, heattreated to Rc 45-48, are good candidates. 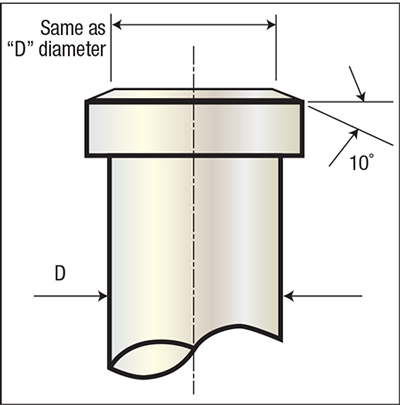 Reducing head diameter by chamfering the contact surface on the head (Fig. 2) will minimize compressive loading and flex at the unsupported outside diameter of the head during initial punch impact. Applying a shear angle to the punch point also will help reduce the forces through the punch body and the punch head. 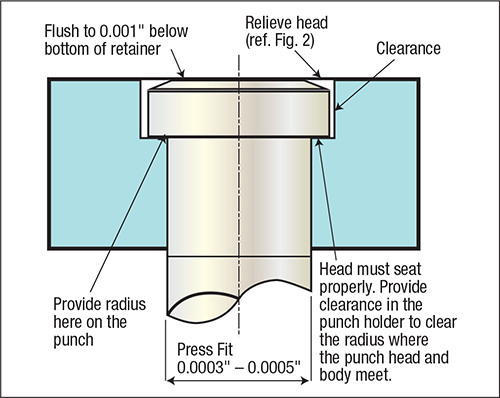 • Engineer the body of the punch to have a slight press fit into the retainer—0.0003 to 0.0005 in. should suffice. • Ensure that the head is fully supported and seated into the counterbored hole in the retainer. • Ensure that the retainer is cleared for the radius connecting the head to the shank. Provide just enough clearance for the radius; avoid excessive clearance. • Fit the punch so that the bottom of the head rests as close as possible to the bottom surface of the retainer, but no more than 0.001 in. below.